At times, my own considerations of design intent must necessarily consider broader social impact. 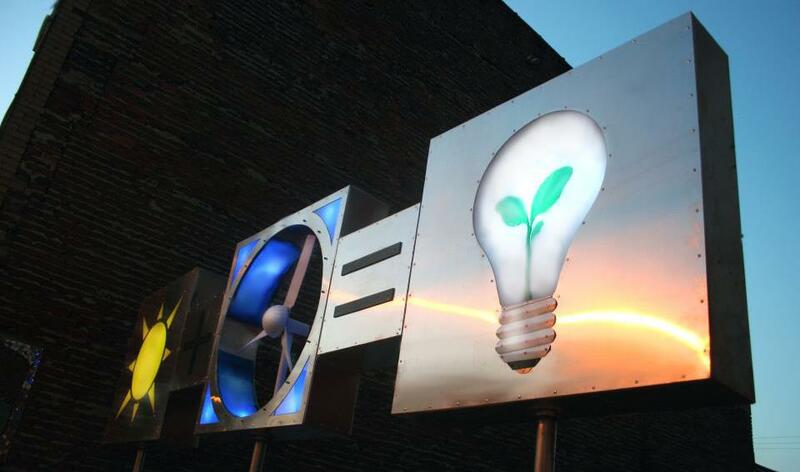 In my work done for Art Energy Design, for instance, colleagues and I employed beyond-logical arguments to sensitively address criticisms regarding “inefficiency” of works such as The EcoEquation [pictured], an energy-producing public art sculpture whose truer function is more so educational, producing awareness versus any appreciable energy via efficient means. Invited article written by Paul A.Cha. Most often, in business, life-cycle analysis for a specified material–be it novel or otherwise–is generally a collected set of physical and energetic considerations of efficiency and thus an estimation of overall cause. Traditional design engineers employ various technical and analytical methods, and the initial process of deciding which considerations make the final cut toward LCA is something I call drawing the envelope. In modern societal systems, of course, all energy and materials have outright costs associated with them, and one is able to forecast a monetary value to these components and their application. Like the layers of a proverbial onion being peeled back, however, the issue becomes more complex by digging deeper. For instance, how must raw materials or ingredients or part or components be transported, and–if looking for overall environmental impact, as well as short-term cost-benefit–how sustainably are they crafted and composed, and what are their longer-term and end-of-life considerations? The envelope is drawn around however many layers of considerations one chooses, therefore, and that is what the designer typically considers. However, in great design there should exist both intent and practicality…form and function. One must also consider the “soft benefits” in crafting their work as an argument, or–hopefully–as the an instrument to influence massive change. After all, moving beyond the realm of the more quantifiable for the sake of accounting, we also encounter and must necessarily consider that product and experience design cannot possibly be purely physical. The flip-side of envelope-drawing is a neoclassical “ethos” and the “pathos” that accompany the “logos” of the design envelope. That is to say, there is an emotive undercurrent one must tap into via design…and those “pathos” present “affect heuristics” which present users and observers with stronger feelings and motivations than a mere logical argument ever could. Society-at-large and perhaps especially creatives need to consider both ends of the spectrum in thinking, and how either end is really interrelated. Technological changes throughout history have broad societal impacts, and art can be just as powerful…and both the tangible and emotive balance need to be considered early on, alongside design intent. In any event, I hope this sketchy and preliminary treatise on the matter is helpful — at least philosophically/phenomenologically/motivationally — in whatever applications that impact you, Dear Reader, and in all projects you can desire to dream up. Thank you for your consideration. Paul Cha studied interdisciplinary materials scientist (M.S./B.S.) in academia and employs his full-time and for a host of advanced materials and energy companies, from early-stage start-ups to multinationals. His design talents also address the “softer side” of product design and experience development for corporate, organizational, and artistic clients/consults worldwide.